I was contacted recently by a parent campaigning for a local school to ensure its admissions policy is properly applied. Over-subscribed schools like this one are a common source of frustration and worry up and down the country. 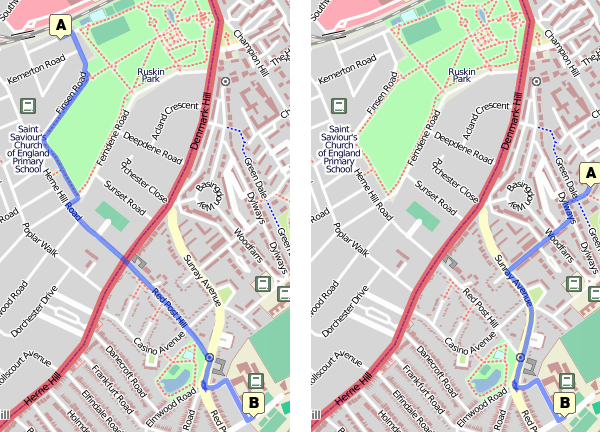 Routes to the school from two locations using CloudMade maps, the home on the right wins by 500m. Parents at the location on the right were told they were too far from the school. The method they use to calculate safe distances to the school actually suggests that the location on the right is farther away than the location on the left! 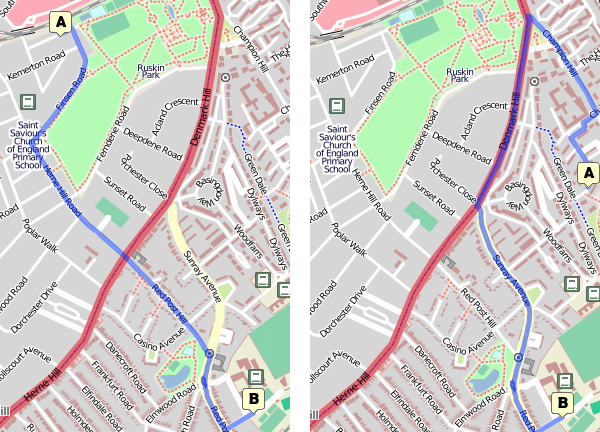 Routes plotted for cars to get to the school, the home on the left wins by 400m. The school’s model uses the Ordnance Survey ITN maps, and apparently doesn’t account for this short footpath at the end of one road. It was pedestrianised 25 years ago. Happily OpenStreetMap has all the relevant data (and a few minor corrections the parent, Jasia, pointed out to me) so anybody can plot the route to prove the point. Incidentally, if you fancy showing your support for this campaign download this letter to the governors, sign it and send it to the address at the top of the document. To do accurate pedestrian routing is a bit of a tricky problem requiring a lot of map data on pedestrian “permeability” of an urban/suburban environment, i.e. lots of details, not just of buildings, but also fences. …although actually your use case here is nice because local people (parents) who know the area can use OpenStreetMap to illustrate a short pedestrian route, and if this fails due inadequate data, these people might be persuaded to add some footpath connections (or at least report some OpenStreetBugs) to help the router next time. All good points Harry, so often it’s the unofficial shortcuts that make all the difference. In this case schools obviously shouldn’t use OpenStreetMap for admissions – imagine the edit wars! But it was nice to be able to illustrate the point, and as you say anyone can correct the map to help a campaign. Well done on the post – I wrote similar statement to support the complaint of the parents. This is really a case of using the wrong data set for the analysis. I think that the message should be that GIS analysts should be careful about the social implications of the data that they use and what it tell them about the world. It also demonstrate how local knowledge need to be included in data that is used and influence local conditions – such as school admissions. I completely agree, it will be interesting to see if this school switches to better data. Shouldn’t the school, under its school transport plan, be actively discouraging the school run by car. The default should surely be 1) walk 2) cycle 3) bus. Thought that was what successive governments have suggested. Order may differ given they forget cycles, but ‘walking buses’ are common.